The Monrovia Police Department is proud to continue its Pink Patch Project partnership in fighting against breast cancer with the City of Hope. The Pink Patch Project is an innovative public awareness campaign designed to bring attention to the fight against breast cancer and support research efforts working to combat this disease. This project will also raise awareness about early detection and treatment for breast cancer. The Pink Patch Project began in 2015, when the Irwindale Police Department raised over $20,000 for breast cancer research by selling pink colored versions of their police patch. In 2016, the Pink Patch Project quickly grew into a collaborative effort between numerous Los Angeles County law enforcement agencies. Beginning in September, the Monrovia Police Department will be selling limited edition pink police department patches and challenge coins for $10 each. We will also be selling limited edition MPD breast cancer awareness pins for $5 and graphic designed t-shirts for $20. All profits from these sales will be donated to the City of Hope to help fund their research for breast cancer. Also, throughout the month of October, in recognition of National Breast Cancer Awareness month, Monrovia Police Officers will be wearing pink patches on their patrol uniforms to continue to help raise awareness. These are the same official patches that will be available for purchase. 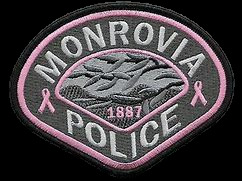 To purchase official Monrovia Police Department Pink Patch items, please come by the police station, located at 140 E. Lime Avenue, and help support the cause. Cash or checks are accepted. Please make checks payable to the Monrovia Police Officers' Association. On behalf of Chief Sanvictores, the Monrovia Police Officers' Association and the Monrovia Police Department, we thank you for your support for a cure to breast cancer.